Sales of this item are closed until further notice due to changes in North American distribution of Walcom products. A smaller HVLP gun designed for Touch-up work and Small Projects, such as jewellry boxes, end tables, small cabinetry and guitars. The Walcom EGO improves upon the legendary STM model and has become the pinnacle for Musical Instrument finishers. Incredible atomization and control in a smaller physical size makes highlighting and bursts simple to achieve. Can be used to spray solvent or waterbased dyes, stains, toners, shellac and clear lacquers with easy clean-up. Very popular with autobody detailers and touch-up repairs! Performance and spray quality is exceptional with all the same controls as full-size sprayguns but with low air consumption that will work with all but the very smallest home or shop compressors. 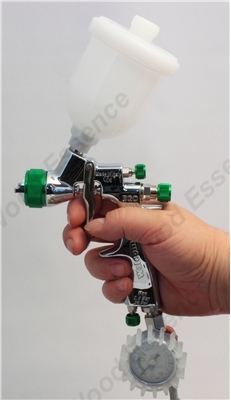 Makes an excellent gun for the first time spray finisher or professional instrument maker. It is an excellent investment that will provide years of reliable service! Kit includes Wet Mil Gauge and Starter Pack of Medium Filters to get you started quickly. Kit comes pre-configured with your choice of ONE nozzle. Choose auxilliary nozzle sets for different materials including dyes, stains, shellac, sealers or clearcoats. See "More Details" page for suggested nozzle sizes. Repair Kits and Spare Parts are In Stock! Working pressure: 29 - 36 psi. click here for the partlist!